Ever since I saw this video from Ingrid a few months ago I had always wanted to make one of these. The concept seemed easy enough, film a few seconds everyday of anything and string it together into one video. I tried this in May and somewhat failed. I was just missing clips from the last three days or so, if there is enough interest I can still put it together sans the missing days. 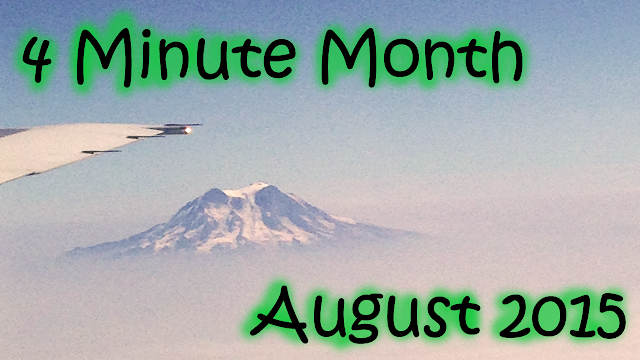 I definitely over edited this video so what was meant to be five minutes turned more into four minutes instead so here we have "4 Minute Month". I really wanted to come on here and share this, I don't talk about much that goes on on my YouTube channel because I rarely post videos but I just truly loved what this turned into and even though most of it is mundane and repetitive, it is the perfect glimpse into my life. I hope to do this again, maybe for December or something. It's hard to do this for every month but maybe that will make for a great project next year which can culminate in a 365 day view of my life. Hmm ideas! So I wanted to share this video here and also walk through and explain some of these memories. The month started with a champagne cruise around Santa Cruz on August 1st. It was cold and windier than expected, and the sailboat really let you feel every single wave and turn. There was no champagne but an abundance of wine as people slipped all over the place. From there I made something amazing which is a bacon wrapped grilled cheese! It took a full pack of bacon to make two sandwiches, it looked frightening but it was so delicious in the end and the only bit of food I needed for that day. Throughout the video it is nice to note how much Cuda, the Great Dane puppy had grown. He starts out a little smaller than Eleanor and by the end of the month he is clearly taller than her. August was a month of birthdays and we celebrated both my mom's and my sister's. The one weekend, August 13th - 17th I spent it in Vegas with my mom visiting my sister for her birthday. Throughout the month there were also glimpses of where I work and some clips of those nights where I'm working late and how different campus is at night. The most prominent theme throughout the month is food. Weekly sushi dates, pasta nights, and the day at the end of the month where my boss surprised us all with ordering lunch when we were working in the office the first weekend after launch. On August 19th my guinea pig made an appearance. I've grown up with guinea pigs and there hasn't been much of a gap where I didn't have one in my life starting from when I was three. Around that time Caprese was on a water strike. While I had been in Vegas her water bottle became clogged and she spent a few days on just the water she was getting through veggies but she became so dehydrated she actually started preparing herself for death. It was heartbreaking and stressful and I spent a lot of time syringing water and vitamins into her before she finally started drinking from her water again. This was also around the time during a heatwave so she spent a lot of time sitting in water (hence the wet belly) to keep her temperature down since she refused to drink water. From August 22nd - 24th I took another weekend trip, this time to Seattle in order to attend a wedding. So that's what I did in August, I'm looking forward to making more of these videos and actually sharing them. Maybe next time I'll actually make it to 5 minutes!